The works in this series are motion studies. They focus on capturing and representing the continuous movements of the body. By isolating discreet gestures, they attempt to develop distinct, fluid delineations of bodily motion. In so doing, the works expand upon existing understandings of both the body’s internal motivations and, by extension, its internal nature. Read Jay Mark Johnson’s full essay here. Jay Mark Johnson’s remarkable large-scale photographs are about space and time, and paradoxically, in the case of the images in this exhibition, about space and timelessness. He takes subjects that have engaged the imagination of artists for centuries—the bustle of the piazza, the routines of the countryside—and transforms them . 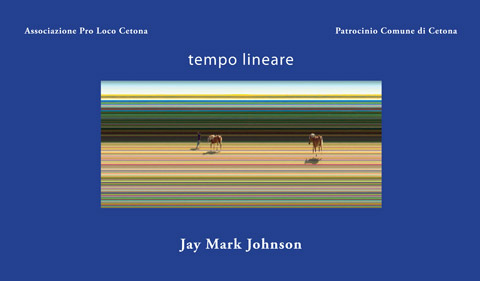 . .
Read Christopher Finch’s complete essay from Johnson’s tempo lineare catalogue here. This exhibit of Jay Mark Johnson shows very appealing, beautiful and familiar images of Cetona, but viewed from a very different perspective. Having had the pleasure of staying a week in Cetona this past summer and being very familiar after spending many pleasant hours in Garibaldi Piazza, I particularly relate to the images of the “Mercato” with people arriving and departing, shopping and socializing, as the weekly Saturday morning event unfolds. Read Barry Barish’s complete x = t i m e catalogue essay here. La mostra di Jay Mark Johnson offre le più belle e più familiari immagini di Cetona viste ora attraverso una prospettiva diversa. Anche io ho avuto il piacere di spendere una settimana a Cetona questa estate, ed essendomi familiarizzato con le immagini del paese dopo aver passato diverse piacevolissime ore in piazza Garibaldi, mi sono restate impresse nella mente proprio quelle particolari del mercato, dove la gente va e viene, fa la spesa e si ferma a parlare ogni sabato mattina. Diese Ausstellung von Jay Mark Johnson zeigt sehr ansprechende, schöne und vertraute Bilder von Cetona, aber aus einer anderen Perspektive. Da ich letzten Sommer das Vergnügen hatte, eine Woche in Cetona zu verbringen und nach vielen angenehmen Stunden auf der Garibaldi Piazza sehr vertraut damit bin, kann ich mich besonders mit den Bildern des „Mercato“ identifizieren, die das ständige Kommen und Gehen von Menschen abbilden, die einkaufen oder Freunde treffen, wie es wöchentlich Samstag morgens der Fall ist. The task of presenting a photographic exhibition of Jay Mark Johnson to the people of Cetona is not an easy one. It is not the sort of normal “institutional” assignment taken on simply to fulfill the responsibilities of one’s job or because one has been “authorized” to translate into words the distinct experience of observing a collection of photographic images. Instead, the task involves a challenge to the mind and to its mechanisms of perception, a challenge in which the viewer is confronted with a series of images in which the “real world becomes unreal”. Read Massimo Mercanti’s complete x = t i m e catalogue introduction here. Presentare al pubblico cetonese una mostra fotografica di Jay Mark Johnson non è facile. Perché non è solo un compito “istituzionale” di esprimere il proprio compiacimento per l’iniziativa o perché non si è un “addetto ai lavori” in grado di tradurre in parole quel che si scorge osservando le immagini fotografiche. È qualcosa che investe l’animo, il pensiero, la riflessione, l’idea di colui che si pone davanti ad un’immagine che rappresenta un “mondo reale diventato irreale” sul quale compare la figura umana riconoscibilissima ma a volte evanescente tra la sua vera natura ed essenza. Le notevoli fotografie fatte su larga scala, di Jay Mark Johnson, centrano il tema di spazio e tempo, e paradossalmente, questo è il caso delle foto della mostra, sul tema dello spazio e assenza di tempo. L’artista si serve degli stessi soggetti che hanno ispirato la fantasia di innumerevoli artisti in tempi diversi come il trambusto della piazza e la consuetudine della campagna, e li trasforma . . .